It's still under construction so please call for full stock details. 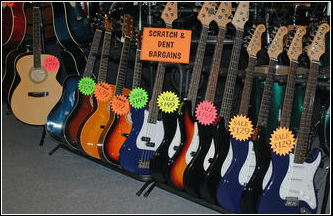 At Just Music in Perth we have an extensive collection of both vintage and brand new electric, bass and acoustic guitars. All our stock is beautifully maintained and set up ready to play. We sell Fender, Gibson, Gretsch, Rickenbacker, Maton, Martin & Co, Cole Clarke and Takamine just to name a few. Just Music in Perth stocks a huge range of slightly damaged acoustic, electric and bass guitars starting at just $59, so if you’re looking for a good quality, great sounding guitar but dont want to break the bank then look no further! Some are simply discontinued lines or sample colours.